THE SIZE IS 9 AA. 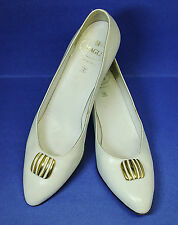 MADE IN ITALY OF WHITE GENUINE LEATHER. IT IS IN A GOOD USED CONDITION. DOES SHOW MINOR SIGNS OF PRIOR. 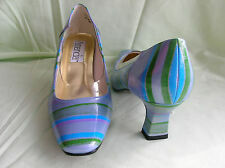 These shoes are Size 9.5 3A (Narrow) 3 1/4" at the widest point. (Item location, Rack F6). Style: Slingbacks Heels. Material: Patent Leather. Color: Black. Size: US 9.5 AAA. We will make every effort to make it right. Preowned with normal signs of use. Good preowned condition. (PRE-OWNED WITHOUT ORIGINAL BOX). All other defects will be closely photographed. Sold as is. We try to our best to provide pictures with and without flash. May show signs of aging on the leather, wearing / worn & scratches. Overall, these shoes are beautiful & functional. From a non smoking household. This is a pair of antique Black Leather shoes by Educator. These have 5 pair of holes for lacing and fancy stitching with cutouts. They are approx 9 1/2" long inside x approx 3" wide with an approx 1 3/4" heel. 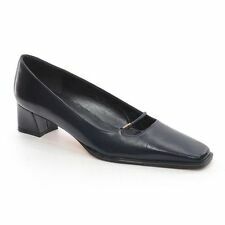 Be comfortable & cute in these kitten heels from Trotters. Add quality and these will soon be your favorite go-to heels. 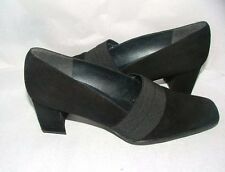 Classic 2" Heels; Slip-on, Extra Narrow Width. Elastic Band Across Top of Shoe. VERY HIGH QUALITY, CUTE STYLE AND SO COMFORTABLE! These sandals are in very good condition. Style - Loafers. We have a large selection of clothing, shoes, belts and handbags. With over 2000 of the most desirable labels in our inventory, you’re bound to find lots of rare and hard to find pieces as well as common necessities. (See picture #7). I also donate a portion of each sale to individuals and charities who are making a difference in the world. There are shoes, then there are shoes. Just as with everything else in life, there are basic, get you where you need to go and that's it sort of shoes, then there are shoemakers who throughout the years have built reputations for elegance, class, quality, and desirability. 2" Wedge Heels. Outside Front To Back 10.25". Inside Front To Back 10.25". Great Used Condition. Up for sale is a pair of orange AMALFI RANGONI sling back heel shoes in size 9S in BUT FITS AN EXTRA NARROW SIZE. new condition without the box. 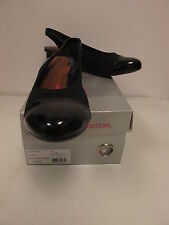 Salvatore Ferragamo classic black leather pumps. These have a 2 inch heel. Gently worn a few times but no damage. Look new except for wear on bottom of soles. Lots of use left. Very attractive. Size is 9.5AA. Made in Italy. Original cost was over $300.00.